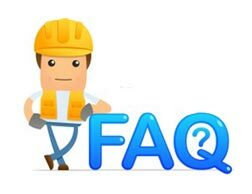 FAQ - Brooks Construction Company, Inc.
Q: Will my new asphalt crack? A: Yes, all asphalt cracks. Asphalt is a flexible pavement and is designed to flex with the stresses put on it. But like all pavements, it will crack at some point. The length of time before the cracking appears will vary based on the subbase the asphalt was placed on. Cracking does not necessarily mean that the structural stability of the pavement is compromised. Q: Does Brooks Construction pave driveways? A: Yes, we pave driveways. We typically do not pave smaller driveways, unless we are in the area paving another project. Feel free to call us and see if we are interested in supplying you a quote. If we are not interested, we can refer you to a few other paving contractors that specialize in smaller driveways. Q: Why do I see marking or scuff marks on my new asphalt? A: No need to worry, this is typical for new asphalt. We refer to these marks as power steering marks. After a period of time, these marks will disappear. Q: Why did you build that road that way? A: Brooks Construction does not design the roads that we build. We are contracted to build the project according to plan by the owner of the project. This could be a city, county or state agency. At times, we have some input on how the project will be constructed, but most often, the design and functionality is out of our hands. Q: Why is concrete louder than asphalt when I drive on it? A: When concrete is used for roadways, there must be grooves put in the finish in order to provide traction for vehicles. These grooves are put perpendicular to the direction of travel. Asphalt does not need these grooves and thus it provides a quieter riding surface. Q: I noticed that all the pavement is finished but the road is still not opened. Why does it take so long to open a road once the pavement is complete? A: You are right that it does take some time to finally open a road once the pavement is complete. There are many other essential items that need to be complete before opening a road up to traffic in order to ensure safety for the traveling public. These items include traffic markings, signs, and guardrails. Once the road is safe for everyone, it is opened. Q: Why did work on this road project start so late in the year? A: Many times, projects are not put out to bid until later in the year. By that time, we have other projects underway which need to be completed first.